Put all the ingredients in a bowl and mix together to form a stiff paste. Roll the mixture into balls about the size of a chickpea, then coat with a dusting of ground almonds. 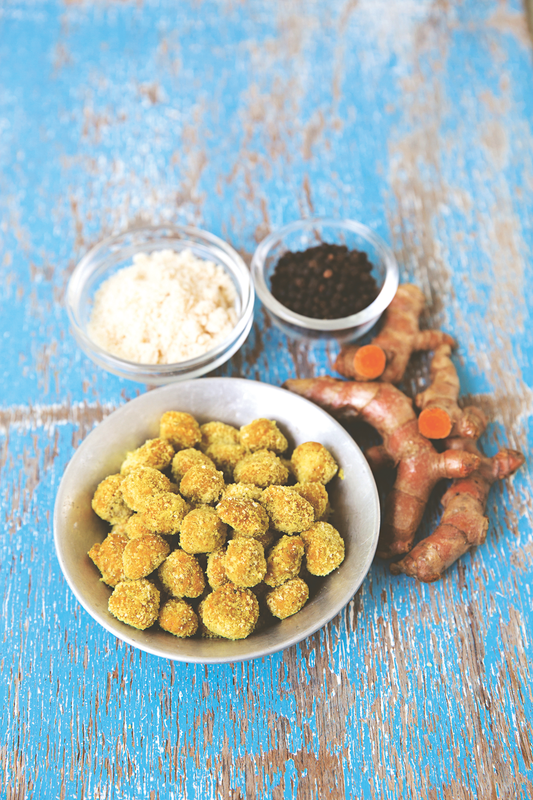 Turmeric has long been used throughout Asia with mentions of the herb dating as far back as 4,000 years. Traditionally it was used as a digestive and to promote longevity. It is rich in antioxidants and recent research shows it can lessen the effects of oxidation damage. Incorporate it into your diet to reduce inflammation in chronic conditions such as arthritis and rheumatism and in skin conditions such as acne and eczema. Turmeric has also been shown to lower cholesterol. Taken from The Handmade Apothecary by Vicky Chown and Kim Walker (Kyle Books).